The Cook Forest Sawmill Center for the Arts is located on 170 Theatre Lane in Cooksburg, Pennsylvania. Stroll through the Craft Market, see a play at the Verna Leith Theatre, attend an art class in woodcarving or oil painting, or enjoy one of their annual Summer Festivals showcasing quilts and fabrics, paintings, photography, pottery and other non-wood related arts. 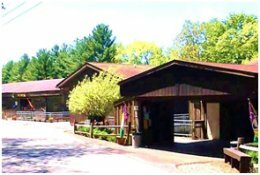 The Cook Forest Sawmill Center for the Arts promotes and preserves traditional arts and crafts. Over 175 artists and crafters sell their juried works at the Craft Market. 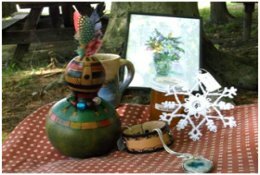 Turned wood items, pottery, baskets, jewelry, paintings, fine art objects, and furniture are only a few of the hundreds of handcrafted treasures for sale. Many original paintings are available for purchase. Visit often as the inventory changes frequently. The Sawmill Theatre hosts live theatrical performances produced by local theatre groups. Equipped with professional lighting, side decks, ticket office, and interior restrooms you will see mysteries, comedies, and major Broadway Musicals. The performances usually run from May through September.